A small cultivator (cropper) is convenient for time that is not a wide field by the use of a passenger use cultivator (tractor) either and the inclining field to cultivate. However, it is the very dangerous in case of mistake the usage even if it is small one. Attention and the maintenance when the cultivator was used were written. This photograph is a cultivator that I am using. The model is using the gasoline engine of four cycles with the manufacturer with FU600 of Honda. After it obtains it with the new article, this has been used for years how many. The breakdown is hardly found. I think that it is a quite good product. There is a rotary fingernail for [tagayaten] in the part in the lower right of this photograph. This rotary exists behind the cultivator. Moreover, there is a resistance stick that is called "Tail sled" just behind the rotary the feature. The soil of the field might be hard, and the cultivator advance to rotate of the rotary suddenly fast if this resistance stick doesn't exist. The rear side of the cultivator is lowered in that case and it is made not to advance to resist of the tail sled fast. 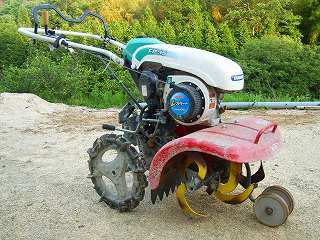 Moreover, when using it in a sudden field to incline, it is necessary to note the cultivator of this type especially. When descending slope, it is very dangerous though there is no problem in cultivation going up on the slope. In a word, the rotary becomes baring if it bends forward, and this side goes up up and it is very dangerous. Then, working of the resistance stick disappears and it advances very fast. This photograph is a smaller cultivator that I am using. The model is using the gasoline engine of four cycles with the manufacturer with FP35 of Honda. There is a rotary fingernail in the part in the lower right of this photograph. The feature in this cultivator has been that the rotary adhered from the wheel to previous. Also in a sudden field to incline, the problem of the cultivator of this type like the above-mentioned seems to be comparatively few. However, knowledge and because human strength is necessary for the taking turning of the machine, it is necessary to experience in a sudden field to incline. In a small of recent cultivator, there are the one that the motor of 100V was used for power and the one that the cassette gas canister was used, too. All are both merits and demerits. Let's choose according to the usage. 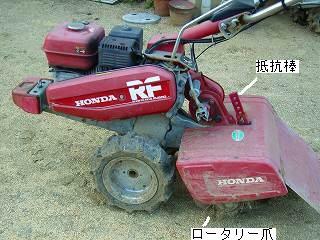 It is checked whether each part is seen before the engine of the cultivator is started and abnormality exists. It puts it into the state of declutching. The lever that rotates the rotary is made to drive (work). The rotation of the wheel is made work. The depth adjustment to cultivate and the resistance stick are adjusted. The rotation of the engine is moderately raised. Do the let in the clutch. It turns to the right or the left when coming to the edge of the field. At this time, there are the one that turns for the operation of the running clutch and the one that turns by human strength. The small one is mostly human strength. Especially noting it by driving the cultivator is a rotation of the rotary in the cultivator back. When moving without field cultivating, the rotation is stopped. Do not use the cultivator as much as possible in the field of the rapid inclination because it is dangerous. After the clutch lever is made a neutral without fail and the engine is stopped, let's do when the rotary part is touched. There is often an accident rolled in the rotary. When storing it without using the cultivator for a long term, gasoline in the fuel tank is pulled out. The fuel of the float is pulled out. The engine doesn't often hang when using it next if this is not especially noted in two-cycle engine.